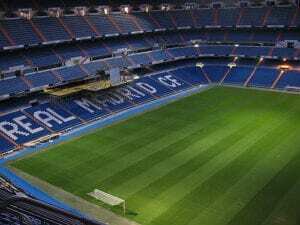 If you’re heading over to the Spanish capital for a match be aware that very few Real Madrid tickets go on public sale because in spite of the Santiago Bernabeu stadium’s capacity of over 85,000 most seats are taken up by season ticket holders (‘socios’). There are ticket booths (‘taquillas’) next to gate 42 of the stadium on Calle Concha Espina but tickets are usually only available for matches against the league’s lower teams, big matches are always sold out. Real Madrid Kick-Off Times: You’d be forgiven for assuming that the day and time of Real Madrid games would be published at the start of the season. Unfortunately, that isn’t the case which proves quite inconvenient for fans who are planning ahead for a city break to include a game at the Bernabeu. Most games take place on Saturday or Sunday at various times and there are quite often Monday night games though these rarely affect Real Madrid. Midweek league fixtures can be from Tuesday to Thursday. The official day and time of kick-offs is usually announced on the Spanish FA Website about 10 days before a match closely followed by a confirmation on the Real Madrid website. Champions League games are always at 8.45pm Madrid time on a Tuesday or Wednesday and are confirmed well in advance. For most footballing visits to the city there’s unlikely to be any problem provide you ensure that you’ll be there from the Saturday afternoon until the Monday morning as that time period covers all but the Monday night game which rarely involves Real Madrid. Getting to the Bernabeu: The Bernabeu lies 5km north of Puerta del Sol in the tourist centre following Paseo de la Castellana. It is situated in a pleasant part of the city so there’s no problem walking there if you wish to do so. On the other hand you’ll find excellent bus and underground services providing transport to the stadium. 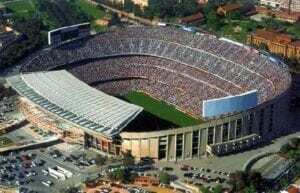 For practical information on how to get there and about the popular stadium tours please refer to our Santiago Bernabeu Stadium page. 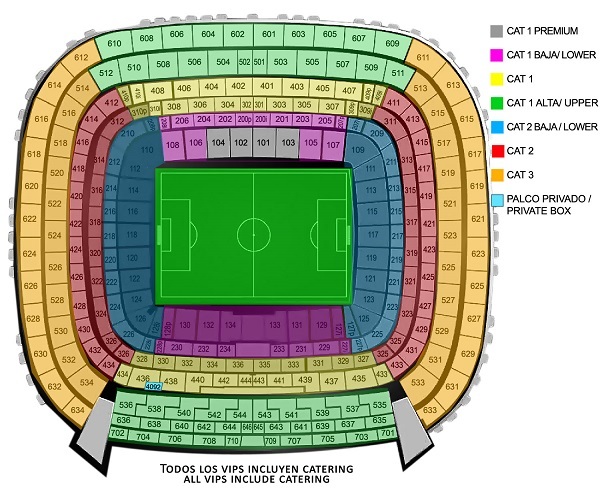 Bernabeu Stadium Plan: The following plan of the Bernabeu is handy for helping you choose which tickets you’d prefer when making a booking. Ticket Orders, Collections and Deliveries: Choose the match you want to buy tickets from the fixture list above then order tickets securely from the sales website. The booking procedure is straightforward, just be sure to order the tickets in the same name as the name you use when booking your hotel in Madrid to avoid any confusion. You’ll be given the option to have the tickets delivered to your accommodation provided there is a 24 hour reception service. Otherwise you can choose to collect them from one of numerous ticket outlets in the city.